ORAFOL has an impressive array of top quality cuttable and printable vinyls for sign makers. Their ORAJET product line of solvent-printable vinyls covers just about every need from temporary bus shelter posters to cast vinyl for rough wall surfaces. There’s just one thing missing. 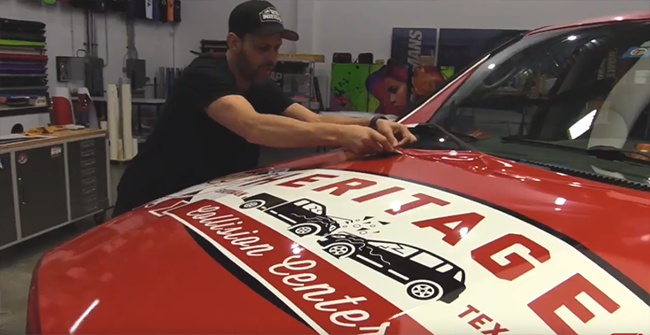 Vehicle wrap experts like Justin Pate teach ‘speed wrap’ techniques that dramatically reduce installation time – and rely on low-tack wrap vinyl. Until now, this has left speed wrap devotees without an ORAJET product they liked. We’re happy to report that this problem has been solved with the introduction of ORAJET Pro Slide wrap vinyls. 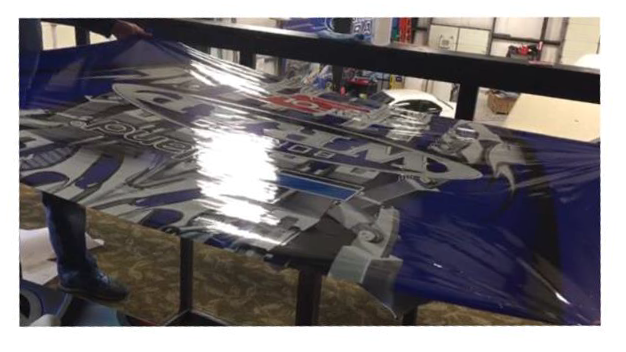 Pro Slide is the name ORAFOL has applied to the new line of premium printable cast vinyls for vehicle wraps. As the name implies ProSlide has a very low initial tack. This feature allows wrap installers to apply large panels by placing them on a vehicle and sliding them into position before tacking them into place with modest pressure. This feature makes vehicle wrap installation much easier and more efficient because installers aren’t fighting the initial adhesive of the vinyl. With ProSlide, there’s no need to repeatedly pull the vinyl free of the substrate to re-position it. Initial adhesion is light and easy, final adhesion after the wrap has been installed is as secure as with any standard wrap vinyl. Adhesive strength after 24 hours measures the same 3.65lb/in as that of 3951RA. So you get the easy installation of a low-tack vinyl without having to worry about lifting after the wrap is installed and delivered. ORAJET ProSlide is more than one cool feature. The newly slidable vinyl has all of the other features that make ORAJET printable media so appealing. RapidAir: The new ProSlide adhesive is a natural complement to ORAFOL’s RapidAir air release liner. RapidAir is ORAFOL’s air egress system that embeds minute channels in the 88# silicone paper release liner. The RA liner strikes a perfect balance between easy bubble-free installation, and great print quality. The RA channels are large enough to allow for evacuation of trapped air bubbles during installation, but not large enough to draw attention to themselves by disrupting the face film. The result is a high-resolution print unmarred by air bubbles or distracting surface artifacts. Print Quality: Speaking of image quality, ORAJET ProSlide vinyls also offer excellent gloss levels and a bright white face film. These features support vivid, eye-catching color that will impress your customers and their customers. Your installed wraps will look great both on the highway and the driveway. Premium Cast Films: The ProSlide product line is comprised of ORAFOL’s best printable vinyls. These are premium quality cast vinyls with exceptional conformability and durability. They provide outstanding performance on challenging compound curves so that you can take on any install with confidence. And the outstanding dimensional stability of these films means your wrap application skills will be on display for years to come. When used with ORAGUARD 290 overlaminate film, 3951GPS is warranted for up to ten years against cracking peeling, and delamination. Exceptional quality: Unlike some other brands, ORAJET vinyl is manufactured in an advanced, state of the art facility that produces flawless quality roll after roll, year after year. The same consistent quality that made ORACAL 651 and 951 favorites for ‘cut vinyl’ signs will make ORAJET ProSlide your go-to solution for digital printing. Speaking of print quality, it’s always best to use the correct ICC profiles. We’ve created some custom ProSlide profiles for the PrismJET VJ54 using our EnduraINK PRO ink. These are for use in LXI RIP 12 or Flexi Sign & Print 121 and can be downloaded from our Support Blog. For all the tips and tricks of installing ProSlide, check out Justin Pate’s YouTube video. ORAJET ProSlide is being launched in three options. As noted above, the ProSlide product are updates of ORAJET RA cast wrap vinyls. The ‘GPS’ suffiix has nothing to do with wayfinding. As you probably already guessed, it stands for ‘glossy ProSlide’. ORAJET 3951GPS is the ProSlide upgrade for 3951RA. This ten-year 2mil cast premium, PVC film is available in 30”, 54”, and 60” rolls starting at $449.00 or $1.19/square foot. Click here to order. ORAJET 3751GPS is the repositionable & slidable version of ORAJET 3751RA. It also comes in 30, 54, and 60-inch rolls. Like 3751RA, it’s an outstanding value that provides the benefits of a premium, 2mil cast wrap vinyl, including an outdoor durability rating of up to eight years. And you get all that premium print goodness for only 93¢/square foot. Thirty inch by 50-yard rolls are yours for only $349.00. For those concerned with sustainability, ORAFOL offers a PVC-free option in 3981GPS. 3981GPS is a premium cast Polyurethane film that lasts up to 10 years outdoors and works with eco-solvent, UV-Curable, and Latex inks. 3981GPS is available in 54” and 64” by 50-yard rolls. 54” rolls are $835.00 or $1.24/square foot. If you’re an ORAFOL fan whose been wishing for something easier to install, your day has come. Now you can enjoy the productivity gains of speed wrap installation techniques without sacrificing the print quality and consistency only ORAJET provides. If you’re interested but not quite ready to order, click here to request a sample roll. Got questions or comments about ProSlide? Feel free to drop them in the comments field below.